Return Home Join the Club! Click Here! 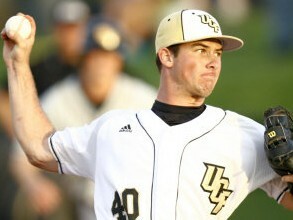 B2 Cafe To Sponsor UCF Baseball Fan Fest On January 18th! With UCF’s baseball season right around the corner, B2 Cafe is thrilled to announce that we will be sponsoring Fan Fest inside The Venue this Wednesday, January 18, 2012. The event begins at 6:15pm, and is free to everyone. For $5, you can purchase a meal ticket, which gets you a B2 Cafe meal and entrance into various prize giveaways. Fan Fest is an opportunity for fans to meet and greet the entire 2012 baseball team as well as Coach Rooney. There will be plenty of fun, food and prizes for everyone! Grab your family and stop by! Games and events will include things like ”Guess Your Pitch” and “Whiffle Ball Home Run Derby,” where guests will be able to guess their fast pitch speed and earn ‘home runs’ based on their age. The event will last until roughly 7:30pm, when fans can then head the UCF Arena to watch the men’s basketball team face off against the Memphis Tigers at 8pm.